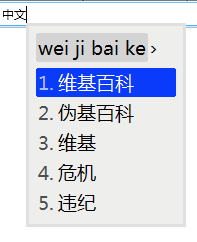 ^ CustomizationGuide - Rime 定製指南 - 中州韻輸入法引擎. [2015-03-09]. ^ UserGuide - 說明書 - 中州韻輸入法引擎. [2015-03-09]. ^ 東風破 - Rime 輸入方案倉庫. [2015-02-10]. ^ ComboPinyin - 宮保拼音 - 中州韻輸入法引擎. Github. [2015-03-09]. ^ 鼠须管，“神级”输入法. 爱范儿. 2012-09-19 [2013-07-19]. ^ 小狼毫/鼠鬚管/中州韻 v0.9.30 拼音、注音多合一輸入法（支援 Windows, Mac, Linux）. 重灌狂人. 2014-07-05 [2015-03-15]. ^ 李盼. 一位匠人的中州韵——专访Rime输入法作者佛振（图灵访谈）. 图灵社区. [2014-07-28]. ^ XIME Input Method Editor - Yet another Rime Frontend for Mac OS X. Github. ^ 同文安卓輸入法平臺 - Trime. Github.